In Asia, goji berry is considered as one of the most nutritious foods for thousands of years. Health Benefits of Goji berry is legendary claimed efficacious to improve vision function, increase immune system, protect the liver, to make a long life, etc.. A large number of micronutrients and phytochemicals in this fruit has been confirmed by scientific research. Goji berries contain many phytochemicals, including polysaccharides, sterols and zeaxanthin, as well as antioxidants such as beta carotene, lutein, lycopene, and vitamin C. Besides the goji berry also contains many minerals such as calcium, potassium, zinc, iron, and selenium. Goji berries can be eaten raw or brewed into tea. Goji berries taste like dried raisins, though less sweet and more dry. Commercially, the goji berry available in the form of fresh, dried, juice or powder. Goji berry is often used in China as an ingredient in soups, while the leaves and young shoots are consumed as a vegetable. In fact, even the Chinese wine made ​​from the goji berry. Goji berry provides two benefits are very important when you are trying to lose weight. Goji berries are loaded with vitamins and minerals to help increase energy and may help control your appetite. Goji berries have a low glycemic index. This means that the goji berry takes a long time to turn into blood sugar that make you feel full longer. Feel fuller for longer, meaning appetite can be controlled which will contribute to weight loss. Goji berries also contain lots of fiber and chromium to control blood sugar and maintain muscle mass during weight loss. L-arginine, L-glutamine, and potassium in goji berries help the body produce growth hormone. With age the body produces less growth hormone. Goji berry helps keep your body lean, slow fat storage, and helps build muscle. Do not stop there, goji berry also menngadung many minerals such as copper, iron, magnesium, manganese, phosphorus, potassium, selenium, sodium, zinc, and thiamin. Nutrients contained in the goji berry can help reduce stress levels. As is well known, stress can contribute to raise the weight. Nutrition goji berry also supply energy, which gives the body a better stamina and in turn gives the power to exercise regularly. When you want to lose weight, it would be ideal to include goji berries in the daily menu. Goji berries can be eaten as a snack with a friend a cup of tea, or you can also get it in capsule form. Anyone who wants to lose weight need to be sure to get enough vitamins and nutrients and goji berry can help provide it. 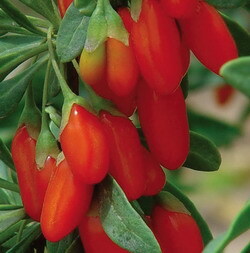 Entering goji berry in any form (fresh, dried, capsules) in the lifestyle section can provide great benefits to health. So whatever your goals, want to lose weight or simply maintain the level of health, goji berries would be a natural way to help achieve all your goals.